With such a huge variety of trampolines available today, finding the one that works for you starts with understanding the primary features and how they can work for you. Trampolines tend to be large items and can be pricey, but we’re here to cut down on the time-consuming task of researching them. We’ll provide you with our list of the best rectangle trampolines for 2018 based on criteria such as materials, size, recommended weight capacity, trampoline weight, and user commentary. You’ll also receive our helpful tips and the possible pros and cons for each item on our list. 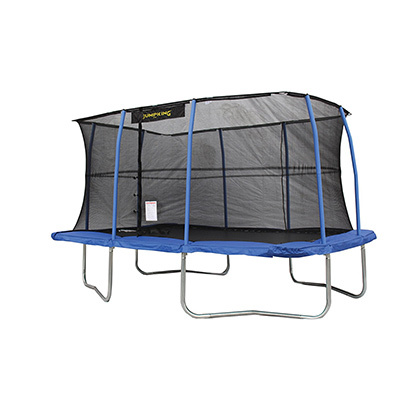 This trampoline from JumpKing offers a wide surface area for bouncing and comes complete with its own mesh enclosure for added safety. You have the option of purchasing expert assembly for this item if you wish. Size: 120 inches/304 centimeters by 168/426 centimeters. This trampoline is priced at an average point and features 100 percent polypropylene durable materials. The combination of foam padding and a net enhance the item’s safety features. However, many users report the instructions are unclear and there is no weight limit listed. 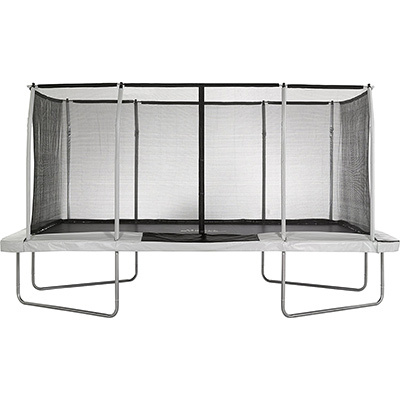 However, given its price, we would still consider it one of the best rectangle trampolines on the market. Here is another rectangular trampoline that includes both a safety mesh and foam edging on the sides to minimize the risk of a fall or other injury. The bedding material is 100 percent polypropylene. Specialized construction using T-brackets adds a measure of stability to the item. Size: 96 inches/243 centimeters by 168 inches/426 centimeters. This trampoline is constructed with safety and longevity in mind. The springs are thick and should last for a long time. They’re also covered with their own vinyl to prevent any kind of snagging when getting on or off the trampoline. We like that this product is specifically designed to be easy to put together as some assembly is always required with trampolines of this size. Specialized stitching on the mat should increase its durability, making this trampoline an option for competitive sporting practice. Weight Capacity: 500 pounds/226 kilograms. 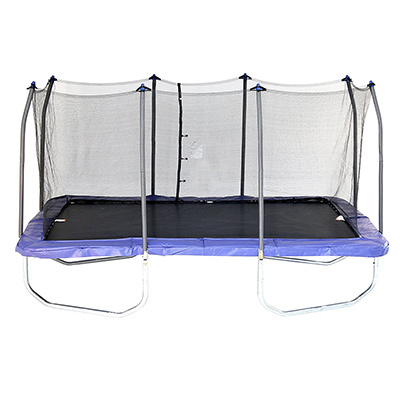 This trampoline is sized and weighted for several children at once and is made from durable materials. It’s also easy to set up, so it checks several boxes. However, the price may be high for some users. You can find other Upper Bounce trampoline alternatives in our Best Upper Bounce trampolines guide. 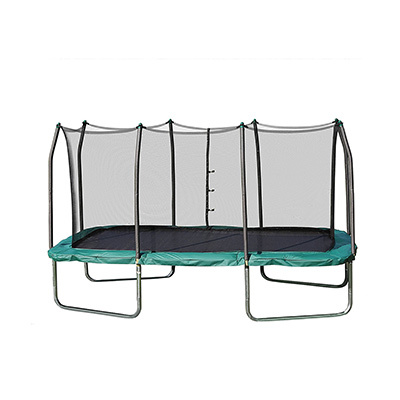 This trampoline features an enclosure net that interlocks with the jumping mat for increased stability. The net itself is made from durable polyethylene to provide both longevity and UV protection. Size: 180 inches/457 centimeters by 108 inches/274 centimeters. Weight Capacity: 250 pounds/113 kilograms. 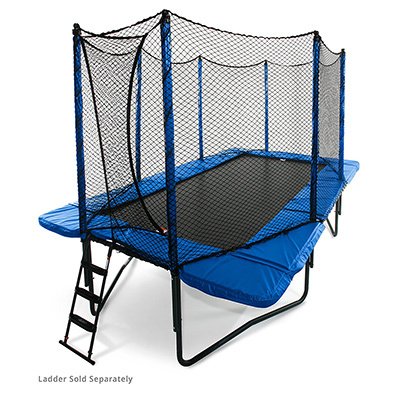 This trampoline has a relatively high weight capacity, durable construction, and is ideal for both competitive bouncing or recreational play. The high weight limit for this trampoline is what we like most about it. Although the price is in the high range, it will provide a great deal of bouncing to several kids, teens, or even adults. This trampoline’s low-impact technology makes it great for performing tricks. Size: 120 inches/304 centimeters by 204 inches/518 centimeters. Weight Capacity: 650 pounds/294 kilograms. Users like that this trampoline is not only strong enough to last well over a decade but is easy to assemble as well. This item includes durable materials, rest zones for multiple users, and is rated for use as a gymnast’s tool. There are few downsides to this trampoline other than a somewhat confusing assembly manual. 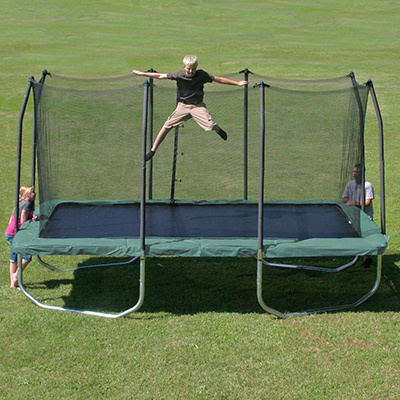 It is definetely one of the best rectangle trampolines, though the price may require a bit of a commitment. 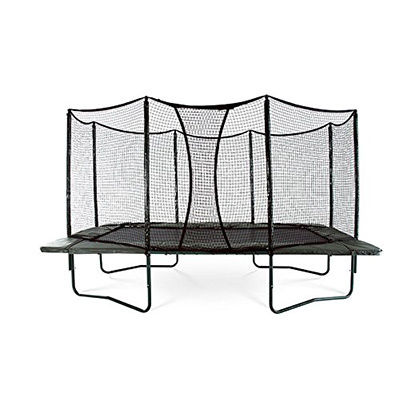 This trampoline is the slightly smaller variation of the traditional Skywalker model. It still provides an adequate surface area for jumping and tricks. Size: 168 inches/426 centimeters by 108 inches/274 centimeters. There are few downsides to this rectangular trampoline. You may have to wait for all the parts to arrive before you can assemble it. However, once assembled, it is one of the best rectangle trampolines. Although some steps will vary based on specific models, you can follow this basic guide to assembling your trampoline. Lay all the pieces on the ground. Assemble the legs, making sure the holes align. Attach the legs to the frame. Connect the springs to the frame. Unroll the mat and be sure the warning label is facing you. Put safety foam over the springs. Connect the mat to the frame. When it comes to trampolines, you want something that provides a lot of bounce and is durable enough to last a long time. Added safety features such as spring coverings or a mesh enclosure are always a nice bonus. Whether you want a trampoline for competitive practice or just play, our list of best rectangle trampolines has something for you. Please feel free to share your trampoline ideas in our comments section. And if you would like to make any suggestion for best rectangle trampolines, we would love to hear it!